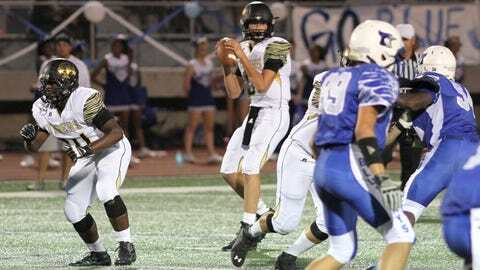 Drew Lock, a four-star recruit who committed to Mizzou last week, threw for 3,062 yards and 35 touchdowns at Lee's Summit High last fall. KANSAS CITY, Mo. — Here’s the funny thing: For all the highlights, the frozen ropes and the Houdini escapes, Eric Thomas’ favorite Drew Lock story, the one that sort of sums up the newest Missouri Tiger best, comes from the absolute football pits. The lowest of the low. It’s last fall, and a good Blue Springs (Mo.) bunch is giving Thomas’ salty Lee’s Summit High School squad the behind-the-woodshed treatment. Lock, the Tigers’ insanely gifted junior quarterback, walks up to his coach on the sideline. His eyes are puffy, pink and flooded with tears. "Are you hurt?" Thomas asks. The coach looks over. More tears. Thomas points at his quarterback’s chest, a finger dangling over the young man’s heart. "Does that hurt?" he asks. "Remember that," the coach replies. "Remember that this is not the feeling that you want." The picture says 1,000 words, and the picture that serves as the background on Drew Lock’s Twitter page is Tim Tebow … well, Tebowing. Lock admires the former Heisman Trophy winner’s passion, both in faith and football. Especially football. "You know, I really liked Tebow when he was at Florida," Lock tells FOXSportsKansasCity.com. "I don’t know — he just kind of had that swagger about him, but it was a good swag. He was a good guy (in person), but when he got out there (on the field), he was just an animal. That’s kind of what I want to be like." You’re getting a big ol’ pussycat away from the field. And a Tiger between the lines. "Drew’s like that," explains Lock’s father, Andy, who played on the offensive line at Mizzou from 1985-89. "He’s a different kid when he steps across the line. There’s a focus that you see out of him that’s almost scary sometimes. "(It’s) a different kid, and (it’s the same way) on the basketball court, too. He’s the sweetest kid in the world off the field, but when he’s on the court, he really has a mean streak, at times." You’re getting a mean streak, a prodigy who hates losing. Hates it the way a cat hates water, the way a 5-year-old hates cauliflower. "(He has) that playmaking ability, the understanding of spacing, the understanding of where the ball is going to go," Thomas says of Lock, the most ballyhooed prep quarterback in the state who, last Wednesday, became Mizzou’s biggest football commitment yet for the Class of 2015. "He’s a competitor. It’s almost — for people to understand it, it’s what Johnny Manziel does with his teams. When he steps on the field, you always feel like you have a chance to win." Lookin’ good! CLICK HERE to check out our gallery of cheerleaders from around the SEC. Like Johnny Football, the 6-foot-3 Lock totes a bazooka for an arm and happens to run like a gazelle. Last fall, the Lee’s Summit star threw for 3,062 yards and 35 touchdowns; the four-star football recruit was rated the 25th-best pro-style quarterback in his class by Scout.com. "To me, he is wise beyond his years, and he acts older than he is," Andy says of his son. "Which is very nice. Very comforting." "He absolutely gets it from his mom, no doubt," the elder Lock chuckles. "There’s no question that’s his mom. She’s got it together, buddy." Mom could hoop, too. Dad blocked in the Big Eight. You know the people who can roll out of bed and whack it off the tee 300 yards? Drew Lock is one of them. Golf is his happy place, his sanctuary, along with fishing; the teen’s most at peace with a rod or a driver in his mitts. He sees things that other kids don’t. He just figures it out and makes plays. "I think the first time he picked up a golf club, he beat me," says Andy, a restaurateur who co-owns the Summit Grill & Bar in Lee’s Summit. "And he hits it a mile and he hits it straight and he’s making putts. I said, ‘OK, that’s not going to work. I’m never going to play you ever again.’"
Don’t test him in H-O-R-S-E, either. Oklahoma wanted him to play hoops. So did Wichita State, whose staff saw another Ron Baker — Baker was a tough-as-jerky quarterback in high school, too, out in western Kansas, back in the day. Drew and Sooners basketball assistant (and former Kansas State star) Steve Henson grew especially close. "It just kind of tears your heart out a little bit," Drew says now. "But you have to do what’s best for you, when it comes down to it." That’s CoMo. Heck, it probably always was. The Tigers offered him as a sophomore. He remembered that. They stayed away from seriously chasing another drop-back quarterback until they saw what Drew was going to do first. He remembered that. He liked that. Coach Gary Pinkel has a contract that runs through 2020. Drew loved that. "I was like, ‘OK, we can stop talking about these positives and let’s just do it,’" the younger Lock recalls. So he did. And now that it’s out of the way, he’s already out there stumping for Pinkel and the Tigers, preaching the gospel of the SEC to every other prep recruit in the greater Kansas City metro area that’s worth a patootie. "I’m going to try to get a list from Coach, if it’s possible that they can do that," Lock says. "But I definitely feel that I can possibly brings some guys there just by talking to them and remind them how good Mizzou is." Full disclosure: Drew grew up an MU fan. His grandfather played there, then his dad. Still, he didn’t just want to cast his lot on a future at Faurot Field before shopping around first. "It almost felt as if he was like, ‘I’m going to write my own story, Dad, I almost want to go somewhere else just to prove that you didn’t do this for me,’" Andy recalls. "As we worked through this, and looked at other schools and talked to other coaches and saw the different (opportunities) the different schools had, I think he realized, ‘Wow, I do have the best of all worlds in Columbia, Mo.’"
It’s a small world, too. Andy Lock’s position coach his senior season at Mizzou? Andy Reid, the second-year coach of the Kansas City Chiefs. "When he got mad at us, when we wouldn’t pass-block well in a game, the week after that, we’d line up along the goal line," Papa Lock recalls. "He made us shuffle sideways, like a basketball shuffle, and we’d have these 45-pound plates in our hands. Every other step, you’d stop and punch with this 45-pound plate. Step and punch, step and punch, up and down the field until he felt it was time to stop. "That was one of the things you never forget about him. He was a pretty level-headed dude and had a pretty good sense of humor, so you knew if he was (expletived) off about something, it was probably warranted." Thomas has another favorite Drew Lock story. It’s the kid’s freshman year, and they’re at a camp down at Central Missouri. Lock takes the reins for a series, and Thomas calls a handoff play with the option to check to a pass. Drew scans the defense, checks out of the run and throws the ball. First down. Same call. Another check. Another throw. First down. So this keeps happening, all the way down the field. Lock has driven his side to the goal line when Thomas calls him over to the sideline. "Hey," the coach asks. "Are you gonna hand the ball off sometime?" Thomas calls the play again. Lock scans the defense, then checks out of it, drops back, and fires a slant in the end zone. Touchdown. "And my assistant coaches are all laughing," Thomas recalls. "They just didn’t know how to play it," Drew explains now. "So I kept picking them apart." "He sees things that other kids don’t," Thomas says. "He just figures it out and makes plays. That’s what’s exciting for us. And it’s going to be exciting for Mizzou." Because you’re getting this, too: Drew and his family were up until roughly 1 in the morning on Thursday, talking and generally decompressing after Wednesday night’s big announcement. When Andy woke up a few hours later, he noticed Drew was gone. The Tiger had left the house at 6:15 a.m. to go lift weights at school, trying to wash that feeling from last November out of his mouth, one rep at a time.